Half Dome: Half Way To Heaven? EVERY HUMAN BEING should be fortunate enough to sleep at least one night on top of a mountain, under a starry blanket. John Muir exhorted his followers, “go to the mountains and get their good tidings.” He minced no words describing the potential power of mountaintop experiences to be transcendental, perhaps connecting hikers with heaven. Loren Eiseley noted that, although adventures like these may or may not connect hikers to God, they often result in hikers having a vision or seeing a marvel. Although results cannot be predicted, the limitless possibilities range from subtle to profound to sublime. There are 1000s of mountaintops, tors, buttes and mesas in the US where a high school biology class could camp out for a night. However, few (if any) can compare with Yosemite’s iconic Half Dome. Twenty-four Biodesign Classes eagerly accepted John Muir’s challenge to climb Half Dome, perhaps in search of a “born again” experience. Although 20 Biodesign classes made it to the top of Half Dome, only 16 were fortunate enough to sleep overnight (before the practice was banned by YNPS). I have to admit that, before each of those 16 trips, I questioned my own mental stability. Those fortunate enough to succeed were offered an extraordinary spectacle that most will never see again. Typically, the Big Dipper loomed above to the north with Merak and Dubhe lined up pointing to Polaris (the north star). Those having trouble sleeping could watch the handle of the giant dipper slowly tick off the changing hours of the night. Of course, each trip was unique and depended on countless variables. However, when the stars aligned favorably we were able to sit in a circle, read some passages from Muir and share what we were seeing, thinking and feeling. During these events, my role as leader shifted to the role as observer. I often marveled at the innate wisdom that the students exhibited. On one particular occasion, the level of communication and spiritual camaraderie rose to such a height that it felt surreal. We were snuggled in a tightly bonded circle. The autumn air was chilly and the stars were so brilliant they appeared to be close enough for us to reach out and pick a basket of them. And then suddenly “it” happened. As students shared their deepest reflections, without warning, they were presented with the dilemma of wondering whether the whole class mysteriously levitated upward toward heaven or if heaven mysteriously descended down to engulf them. The Eastern Orthodox Church uses the term, “mandorla,” (almond shaped design) to depict sacred moments which transcend time and space, including the overlap between heaven and Earth. I am not a religious scholar, but this experience seemed to match the Greek concept. They were in good company. Muir cautioned us that there were no Earthly words that could adequately describe spiritual events. The students were not the only ones with a beguiling mystery. I too pondered over the event. 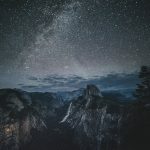 It was only after returning home that it occurred to me that, aside from my wedding day and assisting with our youngest child’s birth, my star-struck experience on Half Dome was the most intense spiritual awakening in my life. 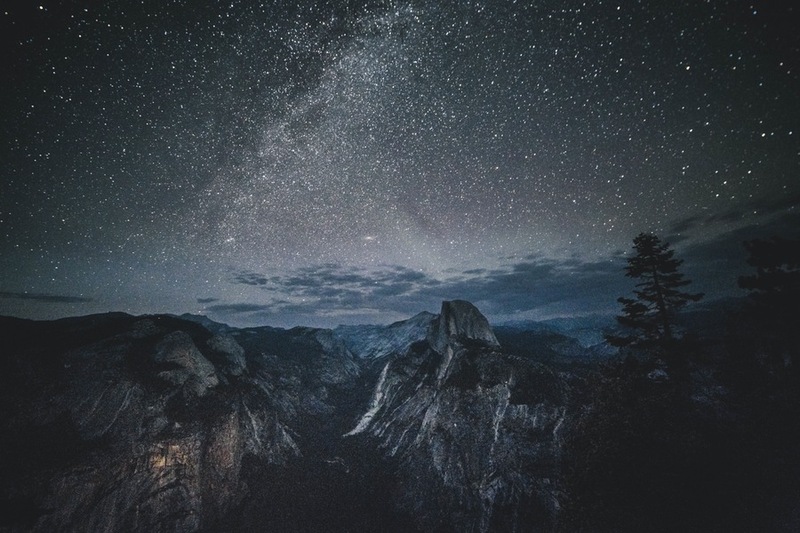 So, Muir came down from Yosemite’s mountains with, “Thoughts and deeds that moved the world.” Each year, our students came down from Half Dome having seen wonders, marvels, even little miracles or perhaps being gifted with a glimpse into heaven. This description of heaven/earth is beautiful yet straight forward. I’m sharing this post as I encourage all my friends to read Biodesign: Out For a Walk.